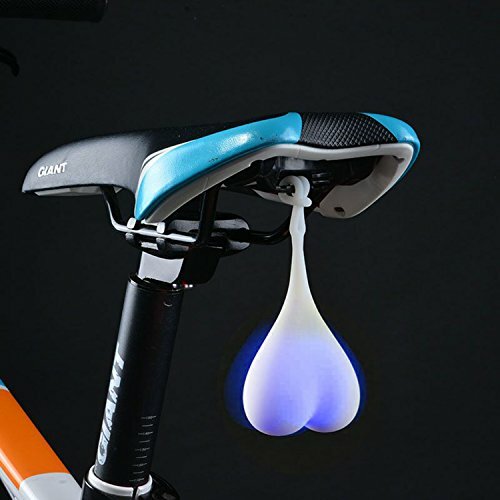 Glowing Bike Balls - Moar Stuff - You don't need it but you know you want it. Because it takes balls (glowing bike balls) to ride your bike in traffic alongside crazy drivers. Especially at night. With the way some maniacs drive, it takes balls to ride a bike alongside them, in this case big Glowing Bike Balls! This safety device (and implicit declaration of your masculinity) hangs underneath your bicycle seat and uses a pair of LEDs to illuminate a silicone….well… sack. Whenever they’re jostled. Why yes ladies – just like your man, all you have to do is touch them to turn them on. Maybe a gentle tickle? Perhaps even a little… err…. sorry, back to the subject in… er, at hand. They come in red and blue. If it’s been a while since you got on a bike, I’d recommend the Blue Balls. Seems appropriate, even if a tad uncomfortable. Besides, who wants red balls? Seems to be they’d be itchy and really uncomfortable. If I got those, I’d have to get them checked out right away by a qualified professional. Oh, and of course, they’re water proof. In fact, the wetter the better. There’s nothing quite like a hard, wet ride to get your Glowing Bike Balls turned on and glowing bright. Although, for some reason, my wife likes to carry mine around in her purse even though she doesn’t have a bike…. Modes: Lighting and flashing… No, not THAT kind of flashing. Even though other silicone products tend to favor AA batteries, this one uses watch batteries.